The Hyderabad-based Bharat Biotech might be the first to come out with a vaccine for the Zika virus if its efficacy can be proved. If it does succeed, this won't be the first time India has come to the rescue of the world. Indeed, the country's generic medicines are a lifeline for millions not only in low and middle-income countries but also in the developed world. 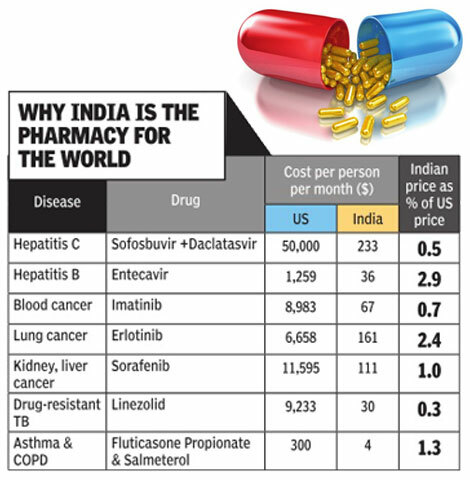 India's generic industry hit global headlines in 2001 when Cipla offered a three-drug cocktail for AIDS at less than a dollar a day , a fraction of the price charged by multinationals. Today, apart from several HIVAIDS drugs, the industry is producing affordable, high quality medicines for several diseases including hepatitis B and C, cancers, drug-resistant TB and asthma. This has been credited to India's patent law, often held up as a model one in preventing the abuse of patent monopolies, and in balancing public interest and the growth of the pharmaceutical industry . Last month, generic manufacturer Natco announced that it would be supplying daclatasvir, a Hepatitis C drug, to 112 developing countries. In 2013, a medicine to treat hepatitis C, sofosbuvir, hit international headlines for its price -$1,000 per pill. Gram for gram, it cost 67 times the price of gold. The sofosbuivir and daclatasvir combination used for the disease costs almost $150,000 per patient for the 12-week regimen in the US. But in India, it is priced at just $700 or a little over Rs 46,500 per patient for the same regimen. And prices are expected to fall further. So how does the Indian generic industry manage to do it? The patent law in India is stringent on what is innovative enough to get a patent. Plus, the crucial section 3(d) in the law, much criticized by multinationals, has prevented “evergreening“ -the attempt to patent different aspects and improvements of the same drug to extend the period of patent -a lucrative game for the pharmaceutical business. Indian courts, too, have played a role. In the case of entecavir for hepatitis B and erlotinib for lung cancer, for instance, instead of blindly handing out injunctions or upholding the validity of patents, the courts ruled in favour of public access to a lifesaving drug. This encouraged companies like Cipla, Ranbaxy and Natco to do a `launch at risk', a term that describes a company deciding to challenge a patent by launching a generic version. This forces the patent-holding company to take them to court, thus testing the validity of the patent granted. Patent oppositions filed by patient groups also spurred the rejection of several frivolous patent claims on cancer, hepatitis and HIV medicines, protecting generic competition. India's patent law also provides for granting of compulsory licences -under which the government can give a licence to a manufacturer other than the patent holder for a royalty fixed by it -for public health reasons. This can be used where drugs are unavailable or unaffordable. The only compulsory licence granted was in 2012 when the patent office allowed the Indian generic company Natco to market sorafenib, a drug patented by Bayer to treat kidney and liver cancer.This move, upheld by the Supreme Court in December 2014 helped bring down the price by 97%, unimaginable through a price negotiation with the company . “How long will this continue? We are already feeling the adverse impact of monopoly and limited access to important drugs. If India cannot manufacture newer drugs, how can we be the pharmacy of the world?“ asked Dr Yusuf Hamied, of Cipla. About half the essential medicines that Unicef distributes and 75% of those distributed by the International Dispensary Association, which procures medicines for 130 countries, come from India. So do about 80% of HIV AIDS medicines for the developing world. But there is immense pressure on India from Europe, the US and their multinational pharma companies to `strengthen patent enforcement'. This could mean that the newer cancer and TB drugs getting patented would be out of reach for millions in India and the developing world with no generic versions to force prices down. India is just 1-2% of the global pharma market. Yet there is intense focus on its patent law. This is “to protect the markets of large pharmaceuticals companies against competition from cheaper generic drugs manufactured in countries like India and Brazil“, explained Dr Amit Sengupta of the People's Health Movement in an article on India's patent law.